Considering a major in physics? Excellent choice! Physics is one of the most fundamental sciences, concerned with the nature of elementary constituents of matter, the character of the universe and its evolution, and the emergent phenomena that arise from complex physical systems. Throughout the course of your studies, you will acquire essential analytical, quantitative, and problem-solving skills that will be valuable in a wide range of careers. The underlying principles of physics are an integral part of many other sciences, including: chemistry, astronomy, biology, earth sciences, meteorology, and engineering. Physics is also valuable in certain areas of medicine, business, computer science, and law. As such, physics majors and minors receive ideal basic training to pursue successful careers in other fields. At the same time, many students enjoy the process of search and discovery in physics research, and have made lifetime careers as educators, or as physicists in national or industrial research laboratories. Our department offers a variety of educational programs to fit the needs of students with career aspirations in all of these diverse areas. The department prides itself on the quality of its teaching, while also maintaining a vigorous research program. The diverse faculty assures an opportunity for close interaction with teachers and mentors. Students are encouraged to participate in ongoing research projects, and many get involved as early as their sophomore year. 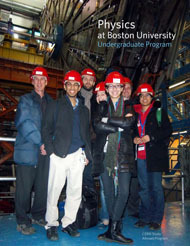 In the spring of 2010, the department launched a study abroad program at CERN in Geneva for students in their junior year. Currently the only of its kind in the US, our program brings students directly to the cutting edge of modern physics. With classes at the University of Geneva and directed research at the CERN, students will work with the world’s leading physicists. There are many advantages to studying physics at Boston University. While located in a dynamic urban environment at a large university, physics students will feel a sense of community in a small department. Each entering freshman is assigned a faculty advisor to guide them throughout their four years and upper- level courses do not exceed 40 students. The undergraduate physics club Photon serves as a social organization for undergraduates involved in physics at BU. Club meetings provide a casual environment for classmates to bond, receive advice from upperclassmen, and form study groups. We hope that you will find this information useful in evaluating the opportunities and advantages of pursuing a physics major at Boston University. If you would like further information on the program, or would like to set up a visit, please contact our Undergraduate Coordinator Courtney Clark.